LAGUNA NIGUEL — What started as a hobby for Will Schmidt seven years ago evolved into a therapeutic method to break free from the hold depression had on him. On April 6, he will paddle 40 miles on a stand-up paddleboard to bring attention to post-traumatic stress disorder. The stress-anxiety disorder hits close to home for Schmidt, who served in the Marine Corps in Kosovo and Afghanistan. He experienced symptoms of anxiety and depression when his tour was over and he had returned home to Laguna Niguel. His paddle to Catalina is an attempt to not only let others suffering from the disorder know that they are not alone, but also to raise money for the Wounded Warrior Project, an organization that raises awareness and provides assistance to those wounded during their time in the service. He has raised $1,600, so far. On April 5, Schmidt and his support team will spend the night at Avalon. The Midwest native will hit the water at 6:30 the next morning. From that point on, it will just be Schmidt, his 14-foot paddleboard and the sea. His support boat, a 29-foot Chaparral donated by a former Air Force captain, will stay a few hundred yards away, watching out for anything headed Schmidt’s way, and to provide him with water and food, when needed. Six months of training has prepared Schmidt for the journey, which he hopes to complete in eight hours. Schmidt’s training consisted of paddling from Newport Harbor to Dana Point and Doheney State Beach. Much time was also spent in the gym, weight training. Schmidt did not expect stand-up paddleboarding to be a way to escape the feelings of loneliness and anxiety that shrouded his everyday life. 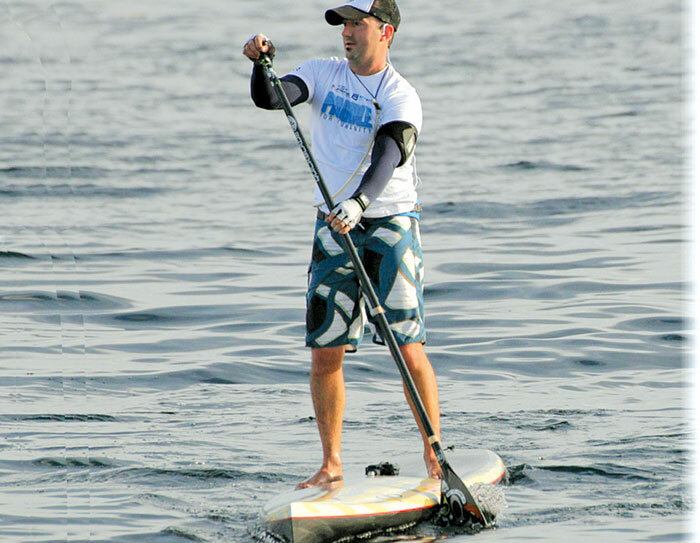 But as he first navigated his way around Newport Harbor, the feelings of freedom and confidence he experienced gave him with what can only be compared to a “runner’s high.” A week later, he purchased a stand-up paddleboard and took up the sport. He’s spoken highly of the watersport ever since. “Paddling definitely helped me overcome post-traumatic stress disorder,” he said. “You can free your mind — and it really is a stress reliever and confidence booster. This is the message he hopes to send to others experiencing symptoms of post-traumatic stress disorder. For more information or to donate to the cause, visit gogetfunding.com/project/stand-up-paddle-against-depression-a-personal-journey.